The Jetsons & WWE: Robo-WrestleMania! is a 2017 American direct-to-video animated film starring The Jetsons. It is the fourth co-production between Warner Bros. Animation and WWE Studios. It was released on February 28, 2017 on Digital HD and on March 14, 2017 on home video. It is the first new Jetsons production in over 27 years since the 1990 film Jetsons: The Movie (and after the deaths of George O'Hanlon and Mel Blanc), the first without the original creators William Hanna and Joseph Barbera (who died respectively in 2001 and 2006) and also the first without any of the original voice cast because all of them had died before production began. Jeff Bergman (from Jetsons: The Movie) was the only actor to return. On modern day Earth, after a live WWE show in Denver, Colorado, Big Show is scheduled to face Sheamus for the WWE Championship in Albuquerque on WWE SmackDown the next night, but Mr. McMahon cancels the title match due to a snowstorm. Enraged by the cancellation, Big Show storms out of the arena and flies a plane through the blizzard only to be lost in the storm when his plane stalls. 100 years later, George Jetson is assigned by Mr. Spacely to supervise a project that involves robots drilling through the surface of the Earth. When the robots report an obstruction on their drilling path, George investigates and discovers a frozen Big Show. After George brings him home and thaws him out, Big Show discovers that he was frozen for 100 years. The next day, Elroy brings Big Show to his school for show and tell. Here, Big Show discovers that the WWE still exists, but is now a robot wrestling promotion. He steals the robot remote controller from Mr. McMoon, the descendant of Mr. McMahon, and uses the robots to take over Orbit City. The Jetsons escape and travel to the Albuquerque show. George interferes with the Sheamus vs. Seth Rollins match, resulting in Roman Reigns, The Usos and Alicia Fox running in to get him out of the ring. Following the ruckus, George convinces Mr. McMahon and the WWE Superstars to travel with his family back to the future to save Orbit City only to end up returning one month later with Orbit City now under Big Show's complete control. Sheamus challenges Big Show to a winner-takes-all match while George is captured and imprisoned along with the other human citizens. As the WWE Superstars battle their robot counterparts, George has the humans band together and revolt against Big Show, parking their flying cars around him to ensure a fair fight between Sheamus and Big Show. Sheamus knocks Big Show out with a Brogue Kick. Instead of pinning Big Show, Sheamus convinces him to continue their battle in the present. In the aftermath of the battle, the WWE Superstars return to their time while Spacely Sprockets gets the contract to rebuild Orbit City with George once again assigned to supervise the robot workers. After the city returns to normal, the Jetsons attend WrestleMania to watch the new human WWE Superstars enter the ring. ^ "Submit To The Jetsons and WWE: Robo-Wrestlemania Trailer". CBR. 2017-01-09. Retrieved 2018-06-13. ^ Schonfeld, Renee. "The Jetsons & WWE: Robo-Wrestlemania - Movie Review". Common Sense Media. Retrieved 2018-06-13. ^ Fowler, Matt (2017-01-09). "The Jetsons & WWE: Robo-WrestleMania! Trailer Debut". IGN. Retrieved 2018-06-13. ^ Balkwill, Ryan (August 21, 2017). 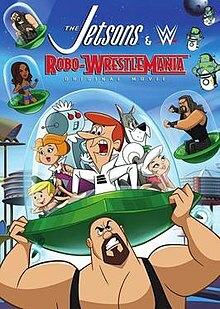 "The Jetsons & WWE Robo-Wrestlemania Movie Review by Ryan Balkwill". RDB Reviews. Retrieved November 10, 2017.